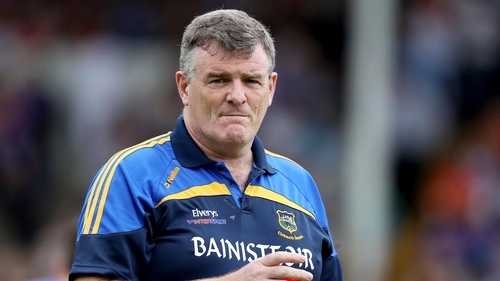 Tipperary manager Liam Kearns has hailed his players' resolve after they recorded a surprise victory over Ulster champions Donegal in Division 2 of the Allianz Football League yesterday. An injury-hit Tipp trailed by 0-10 to 1-04 at half-time in Semple Stadium but Liam McGrath and Liam Casey hit the net as the Premier County outscored the visitors by 2-05 to 0-03 after the interval to record their first win of the campaign. For Kearns, still smarting over a late penalty award in last week's draw against Fermanagh, it was just rewards for his team's determination. "We’ve had bad luck with injuries and the amount of players that are out," he told RTÉ Sport. "Last week there was a penalty given and there’s a picture in the programme clearly showing that it wasn’t a foot-block and it wasn’t a penalty. It cost us a point. For Kearns, the key period in the revival came as Tipp released Brian Fox from sweeping duties and Liam McGrath's 45-metre ended up in the net. "We moved Brian Fox forward. We had been playing him in front of the full-back line up to that. As we moved him forward, we got the fortuitous goal, which was a break we haven’t got all year. "Once we got the break and we had Brian forward, we went after the game. In fairness, the lads really went after it and kicked some great scores. "We had to go after it. The first half of the second half, they were controlling the game, running down the clock and holding possession. I think we kicked 2-05 in the last quarter so that was a great finish and a great win." Donegal were missing some big names through injuries and club commitments - with All-Ireland semi-finalists Gaoth Dobhair - but Kearns was adamant Tipp were just as badly affected by their absent contingent. "Donegal have a very strong panel but for Michael Murphy you can say Michael Quinlivan, for Odhran MacNiallais you can say Robbie Kiely, for Paddy McBrearty you can say Bill Maher.